Over the course of their career, they have often appeared on Spanish television: "The season's nationwide programme presentation gala" (Antena 3 Television), "Gala for the draw of the Copa del Rey (King's Cup) for the ACB (basketball)", El Conciertazo, La 2 News (TVE 2 and International Channel), "This is my story" (TVE 1 and International Channel) etc. b vocal ha estado en el Teatro Campoamor de Oviedo y su próxima parada será el Teatro Sanpol de Madrid. 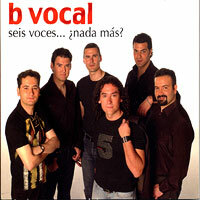 B Vocal: Seis Voces... Nada Mas? We just had the rare pleasure of experiencing b vocal, Spain's fast-rising all male a cappella sextet, winner of the New York City 2010 Harmony Sweepstakes Regional, live on stage at the National Finals in San Rafael. Their wild, funny set, culminating in a hilarious a cappella rendition of "The Barber of Seville" that would make Ward Swingle proud, earned them the most lopsided ballot count for Audience Favorite we can remember. There is so much vocal talent here, and so much natural humor that recalls physical comedians such as Charlie Chaplin and the Marx Brothers, b vocal have become big stars in Spain and Europe, and are well on their way in the U.S. There are 15 songs here, a healthy mix of songs in English, such as The Back Street Boys' "I Want It That Way," The Corrs' "What Can I Do," B.J. Thomas's "Hooked on a Feeling," live renditions of Elton John's anthem "Your Song" and Wet Wet Wet's "Love is All Around" and Extreme's "More Than Words;" and in Spanish, such as Juanes' "A Dios Le Pido," the fairly silly "Mucho Mejor" by Los Rodriguez, Marc Anthony's "Te Tengo Aqui" and Mana's "Clavado en un Bar." B vocal was clearly having big fun on stage at the Finals, and just as clearly having a great time in the studio recording "Seis voces." We love this group, and are pretty sure you will enjoy "Seis voces!" There are 18 finely-crafted tunes on "Vocalitessen," some of our favorites in English include a nice cover of Earth, Wind & Fire's "September," Robbie William's powerful "Feel," Irving Caesar's bluesy "Just A Gigolo" (which segues into "I Ain't Got Nobody"); George Michael's "Careless Whisper," Lieber and Stoller's very fun "Hound Dog" and the traditional spiritual "Oh Happy Day. In Spanish, Carlos Marco's faux horns-rich "No Puedo Mas," Augusto Gonzalez' "Corazones Sin Dueno" and "A Todo Ritmo;" and Coti's lovely "Antes Que Ver El Sol." In fact, there's so much yummy stuff here, especially the Spanish material, which is mostly new to us, that we hardly know what to choose. 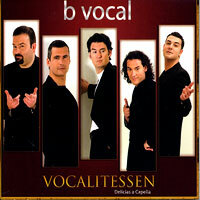 Just pick fast-rising b vocals "Vocalitessen" and enjoy! Beautiful, full-color liner notes. Our Favorite: "Hound Dog," cut #11.